James Henry Breasted (1865-1935) had a career that epitomizes our popular image of the archaeologist. Daring, handsome, and charismatic, he traveled on expeditions to remote and politically unstable corners of the Middle East, helped identify the tomb of King Tut, and was on the cover of Time magazine. But Breasted was more than an Indiana Jones--he was an accomplished scholar, academic entrepreneur, and talented author who brought ancient history to life not just for students but for such notables as Teddy Roosevelt and Sigmund Freud. 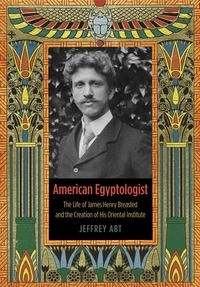 In American Egyptologist, Jeffrey Abt weaves together the disparate strands of Breasted's life, from his small-town origins following the Civil War to his evolution into the father of American Egyptology and the founder of the Oriental Institute in the early years of the University of Chicago. Abt explores the scholarly, philanthropic, diplomatic, and religious contexts of his ideas and projects, providing insight into the origins of America's most prominent center for Near Eastern archaeology. An illuminating portrait of the nearly forgotten man who demystified ancient Egypt for the general public, American Egyptologist restores James Henry Breasted to the world and puts forward a brilliant case for his place as one of the most important scholars of modern times.